There are growing questions as to whether or not U.S. intelligence officials have done more when investigating Tamerlan Tsarnaev prior to the Boston bombing. NBC's Pete Williams reports. One of the Boston Marathon bombing suspects landed in at least one low-level intelligence database two years ago, and the system alerted U.S. agents when he flew to Russia last year, federal officials told NBC News on Wednesday. But federal authorities took no action against Tamerlan Tsarnaev because the FBI had already interviewed him at the request of the Russian government and found no sign of terrorist activity, the officials said. The officials said Russia asked for information about Tsarnaev twice in 2011, once early in the year from the FBI and once in September from the CIA, because the Russians said they had reason to believe he was becoming a radical. When the FBI turned up nothing after the first request, it asked Russia for further information, but Russia never supplied it, the officials said. The FBI asked again after the September request to the CIA, and Russia again failed to respond, they said. The FBI in early 2011 opened a threat assessment, its lowest-level investigative step, which automatically put an entry in a low-level intelligence database, the Treasury Enforcement Communications System, the officials told NBC News. In addition, Rep. Michael McCaul, R-Texas and the head of the House Homeland Security Committee, said Wednesday that Tsarnaev turned up in a database maintained by the National Counterterrorism Center. That database, the Terrorist Identities Datamart Environment, is almost a half-million names long. It is used to craft smaller terror watch lists, including the no-fly list, but does not by itself stop anyone from traveling. Some Republicans have questioned whether intelligence agencies adequately shared information about Tsarnaev, who with his brother is accused of killing three people and injuring more than 200 with bombs at the marathon last week. 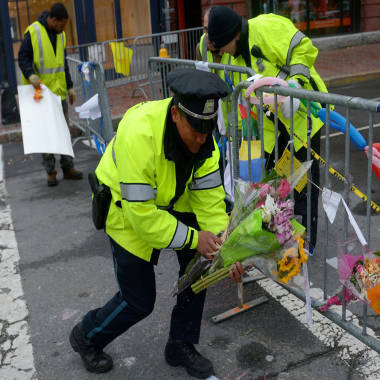 Heightened security, empty streets and memorials mark the the days after the Boston Marathon bombings. When Tsarnaev flew to Moscow last January, the system “pinged,” in the language of intelligence officials. Those “pings” are common, one official said, and a federal agent might get 30 or 40 per day. Because the FBI had checked out Tsarnaev, including interviewing him and members of his family, the “ping” led to no further action, the federal officials said. In addition, he said, FBI agents are short on resources, particularly after mandatory federal budget cuts, and Congress has failed in its oversight responsibility to make sure the bureau is advancing its computer tracking capabilities. “So, in short, the system probably didn’t work here — but there is plenty of blame to go around,” Kohlmann said. Investigators want to know what Tsarnaev, who is of Chechen origin with a U.S. green card, was doing in Russia for the first half of last year. The trip coincided with what appears to be increasing agitation in recent years, including posting radical Islamic videos on a YouTube page and disrupting services at a Cambridge, Mass., mosque. Dzhokhar Tsarnaev, the surviving suspect, has told investigators that he and his brother carried out the attack, that they acted alone and that they did it to defend Islam after the U.S. wars in Iraq and Afghanistan. Senators should have a chance Thursday to hear more about the Boston investigation at a regularly scheduled administration briefing. Senators indicated Wednesday that the officials from the FBI and the Department of Homeland Security will be there. Rep. William Keating, a Democrat who represents Boston, said on MSNBC’s “Hardball” that Congress should examine how the United States and Russia shared, or failed to share, information. But he appeared satisfied with how the FBI has handled the case. “They played it by the book,” he said. NBC's Pete Williams joins Andrea Mitchell Reports to share the latest in the investigation.